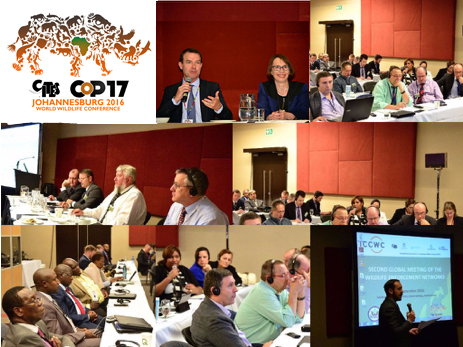 Johannesburg 3 October 2016 - Over 90 representatives from wildlife enforcement networks across the world met in Johannesburg during #CoP17 for frank discussions on strengthening frontline cooperation and coordination to combat transnational organized wildlife and forest crime. CITES Secretary-General John E. Scanlon has described wildlife crime as “a multi billion dollar threat to wildlife and ecosystems, people and economies, which is taking place on an industrial scale”. The second global meeting of the Wildlife Enforcement Networks took place from 28-29 September in Johannesburg, South Africa. It was convened by the Secretariat of the Convention on International Trade in Endangered Species of Wild Fauna and Flora (CITES) and its partners in the International Consortium on Combating Wildlife Crime (ICCWC). The Consortium is a collaboration of agencies comprising CITES, INTERPOL, the United Nations Office on Drugs and Crime (UNODC), the World Bank and World Customs Organization (WCO). Regional and sub-regional wildlife enforcement networks, regional and global enforcement bodies, and intergovernmental and nongovernmental organizations attended. The meeting was organised thanks to generous funds provided to ICCWC by the Department of State of the United States of America and followed the first global meeting held in the margins of CITES CoP16 in Thailand, which was also funded by the United States. Last week’s meeting sought to identify ways of enhancing the effectiveness of regional and sub-regional networks in supporting member states implement their commitments under CITES and other international agreements. Coordinating and strengthening national, regional and cross regional responses to combat wildlife crime was also on the agenda. Participants agreed to explore ways of enhancing collective law enforcement efforts through the use of secondments, twinning programmes, mentorships or attachés, as well as strengthening links and cooperation with relevant regional law enforcement bodies. With the aim of further strengthening WENs, delegates considered best practices and lessons learned from existing networks, and new opportunities for promoting the use of tools and services available to strengthen law enforcement efforts. The two-day meeting benefited from the collective perspective of a number of non-governmental organizations that shared lessons learned and recommendations based on their work supporting regional networks. The full report of the meeting will be made available on the ICCWC website. Since 2010, ICCWC partners have scaled up their collective efforts to ensure that wildlife crimes are met with a more coordinated law enforcement response. Practical interventions include the development of training materials on anti-money laundering with a focus on wildlife crime and the implementation of the ICCWC Wildlife and Forest Crime Analytic Toolkit. The Toolkit provides a comprehensive evaluation of every aspect of national responses to wildlife crime, so that targeted responses can be developed based on the findings. ICCWC has also developed an indicator framework on wildlife and forest crime, for countries to measure and monitor their enforcement efforts, responses and capacity to counter wildlife crime.